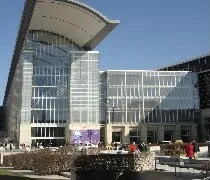 The entrance to McCormick Place in Chicago. This is funny. 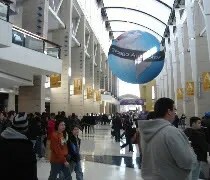 Last month, when I was writing the review for Cobo Hall after we went to the North American International Auto Show, I mentioned I had never been to the Chicago Auto Show or McCormick Place. I happened to be home this year during the auto show and I asked my dad if he wanted to go. You see, he was supposed to drive up for the Detroit show, but snow kept them home. I figured the Chicago Auto Show was a good replacement…and boy, was it. McCormick Place is on Chicago’s South Side right where I-55 (Stevenson Expressway) turns into the famous Lake Shore Drive. When you’re on the highway, it’s really tough to see anything other than a massive building. I had no idea what the front of the building looked like or even how to get to a door from Lake Shore drive, but I have driven by it hundreds of times. We passed on the driving thinking we would probably be driving home during rush hour and rush hour traffic on the Dan Ryan (I-90/94) where we needed to go is awful. Instead, we took the Metra Electric Line from the furthest point south that it runs. Getting to McCormick on the Metra was great. They dropped off at 23rd Street which is the stop underneath the convention center. From the platform, you walk up a set of stairs and you’re inside McCormick. Perfect. The way home sucked. The train we needed to get on didn’t stop at McCormick and we didn’t know that. There were no schedules, trains aren’t marked, and there was no one to ask. Someone else who was waiting for the same train called a hot line and was told the train didn’t stop and that we would need to get on an inbound train to Millennium Station downtown then turn around and get on an outbound train back to University Park. So, after an hour and fifteen minutes of waiting, we jumped on a train and headed downtown to head home. Anyway, back to the show, walking in McCormick place is really impressive. There’s a huge grand hallway with the convention floor on either side. Even though it was a Monday, there were a lot of people there. A lot more than we saw at Detroit on a Saturday. Granted, it was President’s Day. Our first task was to get tickets. We headed up the stairs and found the line for tickets. Insane. 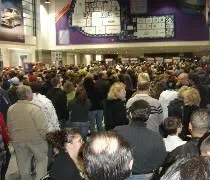 We waited in line 30 minutes just to get our tickets to get in. In Detroit, we walked up to a kiosk and printed tickets in a matter of seconds. Detroit was better equipped with more booths and automatic kiosks. Chicago had maybe six windows and no computerized kiosks. After getting our tickets, we headed to the first of two large convention rooms. For the most part, the show as the same as what I saw in Detroit, but it was all new to my dad. At this point, I realized why Detroit officials are pushing to expand Cobo Hall. 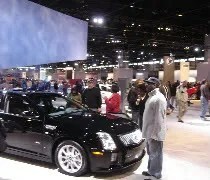 The Chicago Auto show had the same exhibits, same cars, same displays, etc., but there was so much more room. Good thing too because there was so many more people. It took us about an hour to walk through the smaller of the two exhibit spaces. Near the back was a number of displays for after market vendors, the Army, and a food court feature Chicago classics like Connie’s Pizza and Robinson’s Ribs. After leaving the first hall, you have to get your handstamped and cross the grand hallway where you walked in to get to the second exhibit area. The second one was much, much bigger than the first. It was here that Chrysler was set up which is where we really wanted to look. Something really different from Detroit was the Chrysler test area. They had a track set up where you could drive a Chrysler vehicle over a number of different obstacles so they could show off their performance. It’s not the same as the Hybrid track Detroit had in the Michigan Room. This was totally different. There was quite a line for that, so we passed. We headed over to the Dodge trucks which were set up in the back by themselves. There was a lot of extra room for them whereas in Detroit they were jammed together. There were two more food courts in the bigger room. Both were elevated so you could look out over the show floor while you ate. Again, we passed knowing we were going somewhere else to eat.